You are at:Home»News»Who really controls Naspers? Listed printing and publishing company Caxton on Wednesday presented its understanding of the Naspers control structure which, if true, would mean the end of the Keeromstraat-Nasbel voting pool that currently controls the Naspers group. 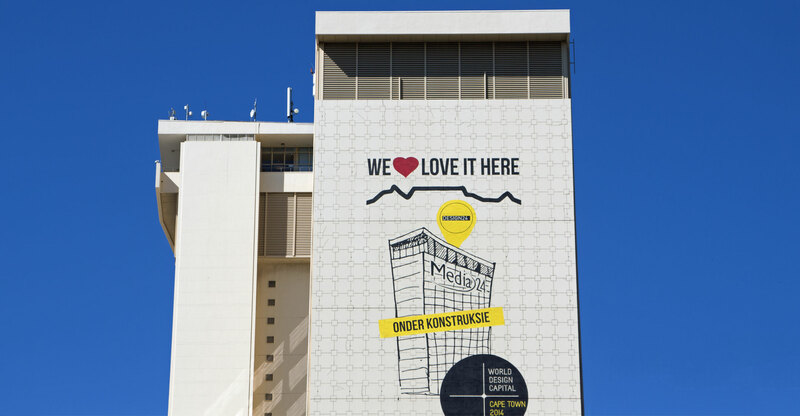 Caxton argued this before the Competition Tribunal in support of its application to intervene in proceedings that will consider a merger between JSE-listed printing company Novus and Media24. Media24 is controlled by Naspers. The question still hasn’t been answered definitively: who controls Naspers? The merger process started in 2014 when Media24 and Novus notified a merger when Lambert Retief, former non-executive chairman of Paarl Media Group, as Novus was then known, wanted to retire. Through this transaction, Media24 would have acquired the remaining shareholding in Novus that it did not yet own. At the time, the tribunal approved an application by Caxton to intervene in the proceedings and, in response to Caxton’s presentations, ordered a full investigation into the Naspers control structure. Media24 and Paarl Media Group then withdrew the notification of this merger and opted to list Novus. This meant the inquiry never took place. At the time, Caxton, which competes with Novus and Media24, tried to interdict the listing on the basis that it constituted a merger that should first be approved. The tribunal dismissed the case and the listing proceeded, but Caxton won the case on appeal. The current hearing is the result of this appeal decision. Earlier this year, the Competition Commission recommended the approval of the merger on condition that Media24 unbundle its 93,9% stake in Novus to Naspers shareholders. Media24 would retain only 19% of the shareholding and have no management control. The commission is of the view that the condition would address any competition concerns. The tribunal still had to give its approval. However, on Wednesday Caxton argued before the tribunal that the merging parties in the latest notification again failed to disclose fully who controls Naspers. The company argued that the tribunal first had to establish the identity of all of the entities that directly or indirectly control Novus, and consider the competition concerns, before it could deliberate whether the unbundling condition would address such concerns. Media24, on the other hand, argued that the conditions constitute a de-merger and it would be practical and sensible to accept the conditions without embarking on a lengthy inquiry to satisfy the questions that Caxton has been raising over a number of years. Naspers’s controlling structure is extremely complex. According to the Competition Commission’s analysis, based on information supplied by the merging parties, Media24 is the primary acquiring firm and it is controlled by Naspers. Naspers is controlled through high-voting A-shares held by Nasbel, Keeromstraat 30 Belleggings and Wheatfields Investments. Nasbel and Keeromstraat hold 53% of the voting rights and vote in consultation with each other based on a voting pool agreement. Wheatfields has 12,6% of the voting rights in Naspers and is not part of the control structure. Sanlam is a 50% shareholder in Wheatfields. Wheatfields holds minority stakes in Nasbel and Keeromstraat, but that does not afford it with control. Nasbel is 49% controlled by Heemstede, a wholly-owned subsidiary of Naspers. 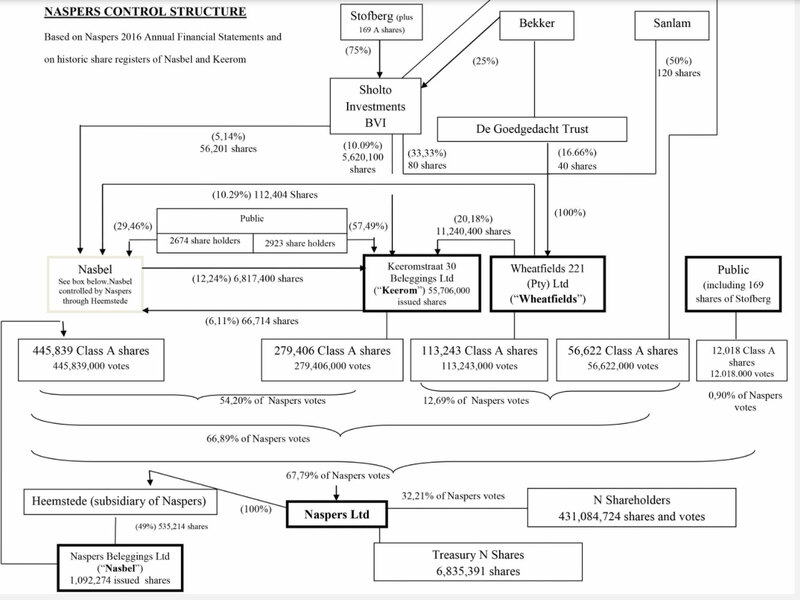 The remaining shares in Nasbel, according to the commission, are widely held by 2 611 shareholders. 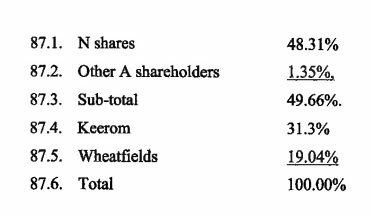 Keeromstraat has 2 843 shareholders, none of them being controlling shareholders. Caxton has a different view, largely based on an affidavit submitted to the tribunal by Denise Vos in 2007. Vos, at the time head: secretariat and intellectual property at Naspers, states in her affidavit that the locus of control in Naspers “clearly” rests with Nasbel, Keeromstraat and Wheatfields. This, Caxton contends, is corroborated in Naspers’s filings to the US Securities and Exchange Commission and disclosures in its annual financial statements. It contends that Wheatfields is held by Sanlam (50%), the Goedgedacht Trust (16,6%), which is a related party to Naspers chairman Koos Bekker, and Sholto Investments (33,3%), an offshore company in which Bekker and Cobus Stofberg hold shares. If the commission failed to consider Wheatfields as part of the Naspers control structure, it also failed to consider any interests that Sanlam, Sholto, Goedgedacht, Bekker and Stofberg have in printing and publishing and could not have properly considered the effects of the merger, Caxton argues. Caxton further contends that Heemstede, a fully-owned subsidiary of Naspers, owns 49% in Nasbel. Nasbel, in turn, owns 33,2% of the voting rights in Naspers. Based on information from Naspers, it seems Naspers controls itself, or at least jointly, Caxton states. It argues that in terms of the JSE listing requirements, shares in such circular structures are treasury shares which cannot vote in major matters, including major transactions, schemes of arrangement and takeover bids. Caxton states that it is clear that without the voting power of the Nasbel shares, Keeromstraat would not, on its own, be capable of maintaining the Naspers control structure. The voting pool would no longer operate and Keeromstraat would need the cooperation of Wheatfields to do so, which confers control on Wheatfields. Wheatfields had a legal representative on a watching brief at the hearing. The Naspers companies did not respond in detail to the allegations regarding its control structure. It argued that an inquiry into the control structure is unnecessary in light of the unbundling conditions, which will remove any control by Media24 over Novus. If the tribunal found that at 19% shareholding there is still any control left, it would reduce its stake even further. Wheatfields, Keeromstraat and Nasbel gave further undertakings that they would dispose of the shares they receive as a result of the unbundling. The companies argued that Caxton has nothing substantive to say about the unbundling condition. They contended that if the link is broken at the level of Novus and Media24, it would serve no purpose to engage in a full-scale enquiry into Naspers, except to satisfy the curiosity Caxton has had over a long period. If the tribunal allows Caxton’s intervention and the full inquiry into the Naspers control structure, shareholders might get more clarity as to who directs strategy in the multinational group that carries huge weight on the JSE. If Caxton is correct and the voting pool is indeed broken, it might mean a shift in control. The tribunal has reserved judgment. A box with the word Guptas in it seems to be missing from the diagram. That can be the only explanation why Naspers owned DStv provides a platform for GuptaTV (ANN7) on channel 405. I mean, would Naspers really take money from a family that has labelled them as WMC? Naspers has no option but to keep ann7 on their platforms, else zuma pulls the plug on MultiChoice by cancelling their broadcasting licenses! I think. Pulling a broadcast licence is not that easy. It has to go through the regulator (ICAASA) not JZ. It seems to be a case of MultiChoice/Naspers will take money from anyone – even the Guptas. well isn’t business just prostitution by another name? Charlie, No,no,no, this is africa and icasa also eats out of the trough!MC has no option but to “bend backworths” & be nailed!